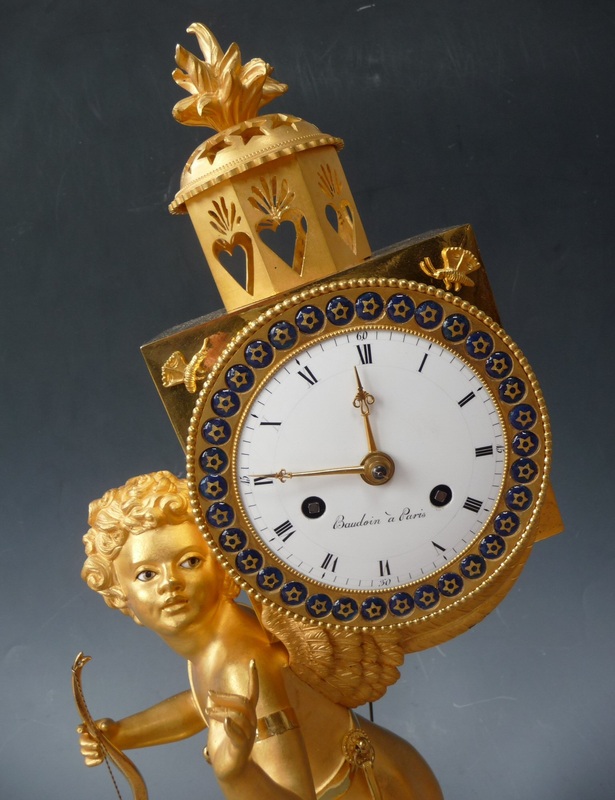 A fine gilt bronze sculptural mantel clock ‘The Magic Lantern’, by Baudoin à Paris, c. 1800. Dial signature Baudoin is listed in Tardy page 35, Le quai de l'Horloge, Paris. Finely cast and chiselled ormolu case representing Cupid and his magic lantern. Enamelled dial with Roman numerals, a decorative lunette with blue enamelled rosettes. 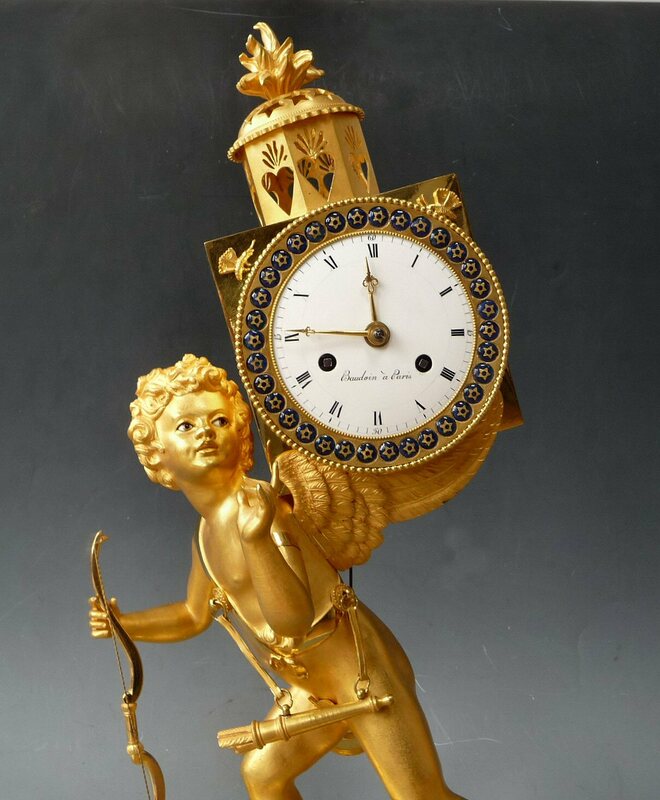 Cupid with enamelled eyes. 8-day spring driven movement with anchor escapement and countwheel half hour striking on a bell, silk suspended pendulum. 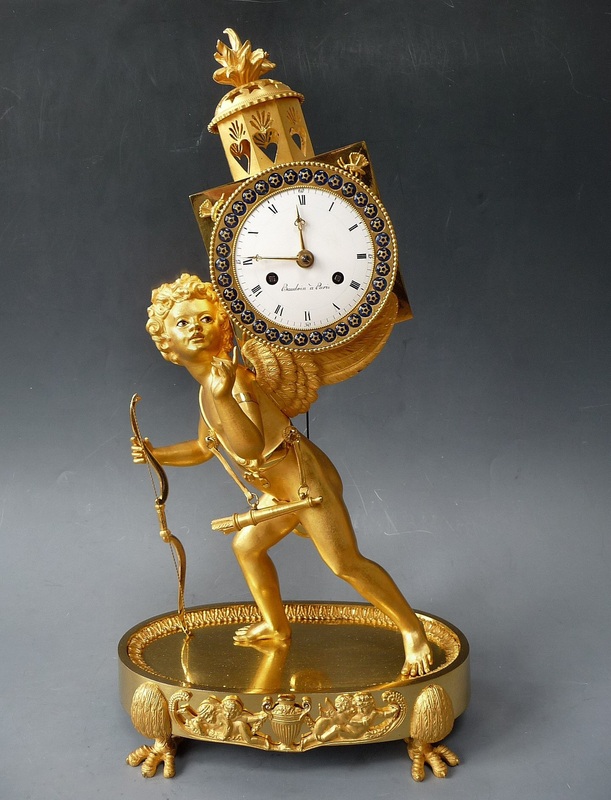 Cupid with bow and quiver carries on his wings the fire-gilt lantern with a flaming torch, he stands on a gilded oval base with two putti in the frieze playing around a vase, raised on eagle’s feet. The sculpture as a whole symbolizes the love, falling in love, pleasures and joys, impermanence through time. Case attributed to Jean-Simon Deverberie (1764-1824). He was an extremely successful designer, bronze manufacturer and marchand-mercier. 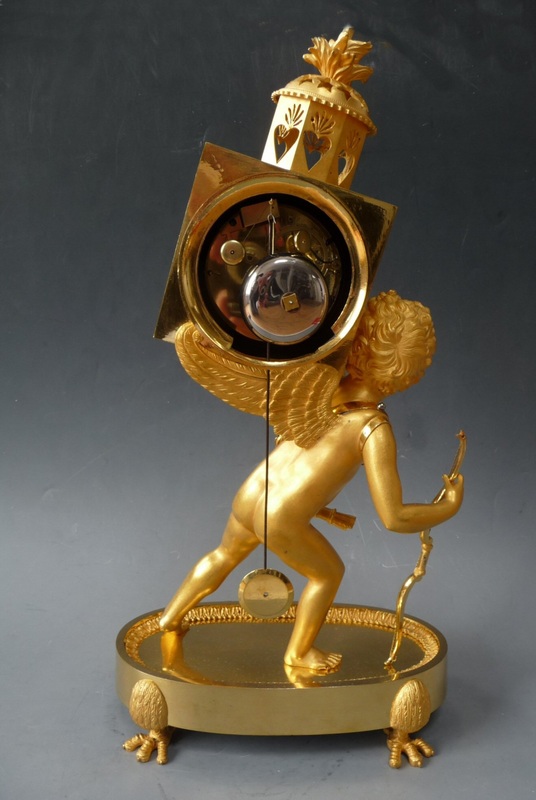 Well known through the series ‘Pendules au Negre’ and 'Pendule l'Afrique'. Referenties. Pierre Kjellberg : ‘La Pendule Francaise Du Moyen Age Au Xxe Siecle’ page 447 and Elke Niehüser ‘Die französische Bronzeuhr’ page 129 and on cover. HxWxD 48x24x14 cm.